(KPIX 5/AP) — A woman who lived through one of the deadliest train derailments ever hopes her experience serves as a wake-up call about allowing highly-volatile fracked crude oil to be transported by rail – as has been proposed in the Bay Area. Thursday in Washington, a Senate transportation panel grilled federal railroad officials over delays in drafting new safety regulations in light of recent deadly oil and commuter train accidents. Railroads are also taking too long to implement safety improvements Congress ordered under legislation passed seven years ago, lawmakers said at the hearing. Meanwhile, a report released Thursday by Canadian regulators said the crude from the Bakken region of North Dakota is as volatile as gasoline. 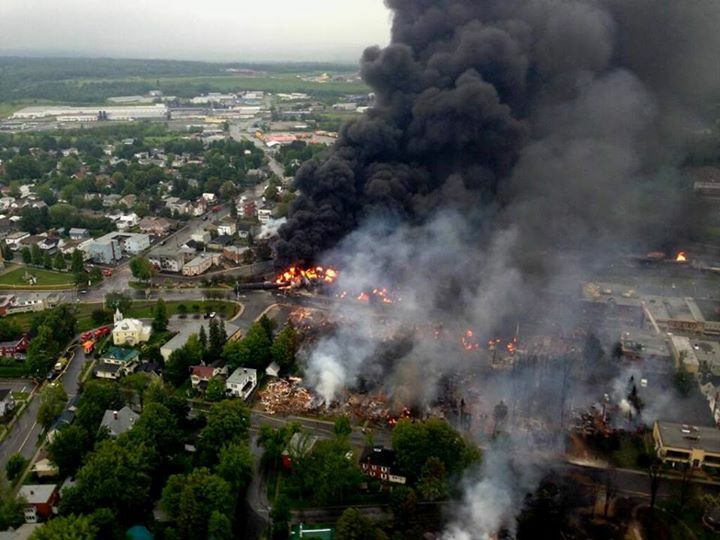 The derailment of a train carrying this oil last July in Lac-Megantic, Quebec created an inferno that destroyed much of the town center. KPIX 5 spoke to a Marlaine Savard who was just a few miles away when the train carrying 30-thousand gallons of fracked crude derailed. “We knew for sure that people were dying,” said Savard. 47 people were killed in the disaster. The toxic mess left behind will take years to clean up. “It’s like 50 football fields that are really highly contaminated,”she said. Last week, federal regulators issued emergency regulations that require shippers to test crude coming from the Bakken region to make sure it’s properly classified while banning certain older-model tanker cars. But they still haven’t issued any new rules for the much more common tank cars that exploded in Quebec. Bay Area refineries are still receiving most of their crude by ship and pipeline, but experts warn that could soon change. “This is the refining center of the western U.S.,” said Greg Karras with the advocacy group Communities for a Better Environment. “It’s a huge amount of crude that is being proposed to be delivered here by rail now. Karras said it all comes down to profits. The tanker cars are mostly owned or leased by oil companies, that don’t want to pay. “There are alternatives, they can afford them. Karras said fracked Bakken crude isn’t the only threat. He said trains are now hauling tar sands oil, the dirtiest kind of crude. “It sinks to the bottom when it gets into the water body like the bay, and this has happened in other parts of the country,” he said. WesPac Energy Group has plans to rebuild an old oil storage facility in downtown Pittsburg and bring in fracked crude oil by rail, ships and pipelines. The Pittsburg city council is set to vote on the proposal’s environmental impact report in the coming months. This entry was posted in Derailment, Explosions and tagged Lac-Megantic Quebec on March 7, 2014 by stopcbr. A group of us attended the forum in Martinez on February 26. We were privileged and moved to hear Marlaine Savard, spokesperson for a citizens’ group in the region of Lac-Mégantic, Québec. She shared in a very personal way about the crude oil by rail conflagration in her small town of Lac Megantic in 2013. A crude oil train derailed and killed 47 people and devastated their downtown. Thank you to Constance Beutel for filming her story. This entry was posted in Derailment, Explosions and tagged Lac-Megantic Quebec on March 1, 2014 by stopcbr. Benician Kat Black put together this video showing the faces and telling stories of those who were lost in the catastrophic derailment and explosion in Lac-Mégantic, Quebec last July. Get out a box of Kleenex, and prepare to be moved … and motivated. 6 July 2013 — Canada — A freight train containing 72 tank cars of crude oil that originated from the Bakken formation runs away while unattended and derails in Lac-Mégantic, Quebec. Several cars explode, resulting in 42 confirmed dead and 5 missing and presumed dead. More than 30 buildings in the town’s center, roughly half of the downtown area, are destroyed. It is the deadliest rail disaster in Canada since the St-Hilaire train disaster in 1864. 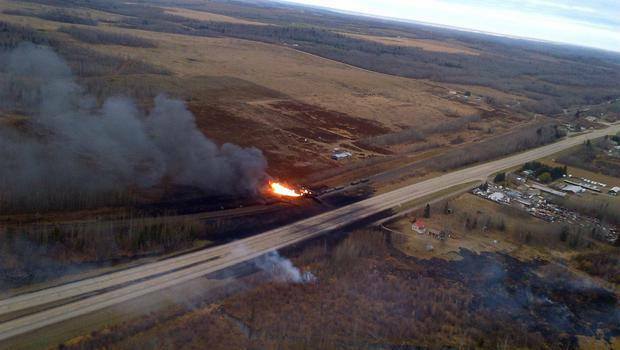 19 October 2013 — Canada — A Canadian National Railway freight train with 13 cars carrying crude oil and liquefied petroleum gas derails west of Edmonton, Alberta. Local residents are evacuated in Gainford, Alberta, located 53 miles (85 km) from the capital. A fire results. No one was injured. 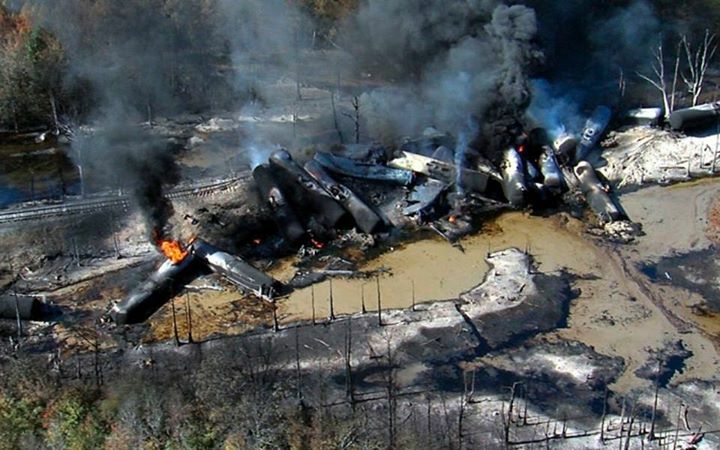 8 November 2013 — United States — A 90-car freight train carrying crude oil from the Bakken formation in North Dakota, from Amory, Mississippi, to a refinery in Walnut Hill, Florida, derails and explodes near the town of Aliceville, Alabama. The flames, which shot upward 300 feet high, were left to burn themselves out. There were no fatalities or injuries. 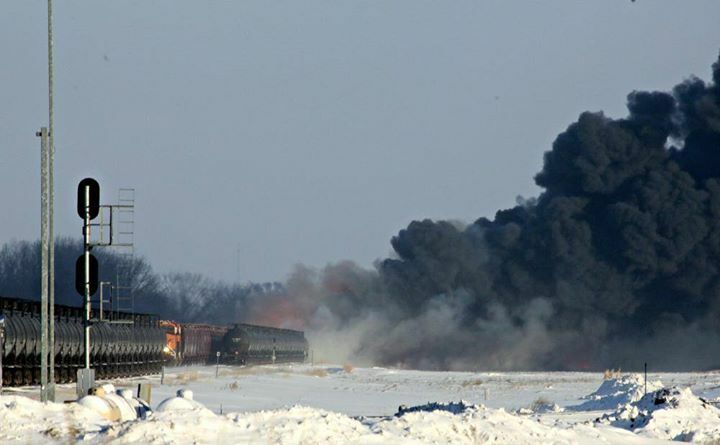 30 December 2013 — United States — Several grain cars from a westbound train derail and strike an eastbound train, carrying crude oil from the Bakken formation, near Casselton, North Dakota. Several crude oil cars explode, resulting in large clouds of toxic, black smoke, which forced an evacuation of the area. No casualties were reported. 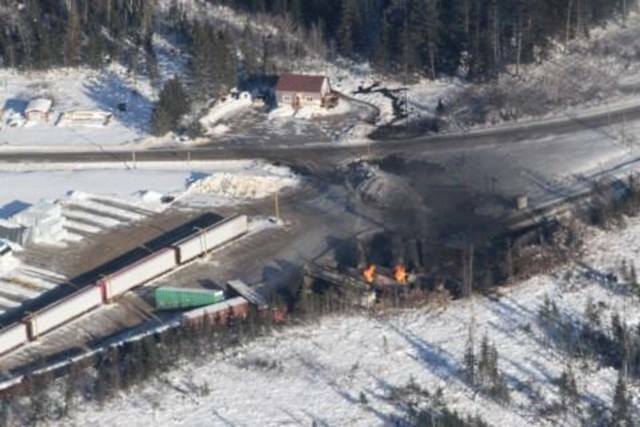 7 January 2014 — Canada — A Canadian National train carrying crude oil and propane derails near Plaster Rock, New Brunswick and burns for days. The resulting fire forced an evacuation of about 150 people from within a two-kilometre radius. No injuries were reported. 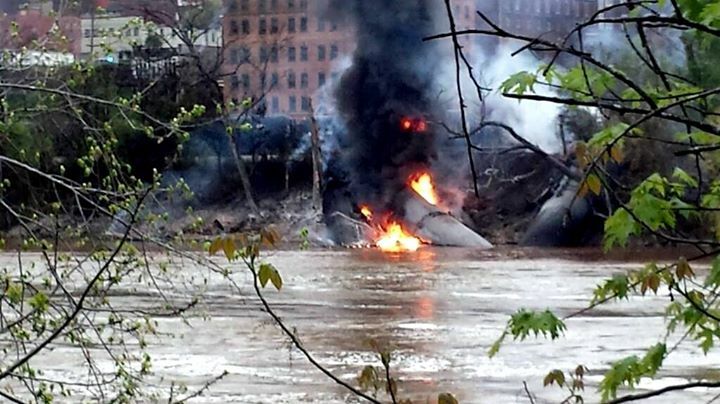 30 April 2014 — United States — About 15 tanker cars on a CSX unit train carrying Bakken crude oil through downtown Lynchburg, Virginia derailed along the James River. At least three of the cars broke open and ignited, while also spilling at least 50,000 gallons of crude into the fiery river. No injuries were reported. This entry was posted in Derailment, Explosions and tagged Aliceville Alabama, Casselton North Dakota, Gainford Alberta, Lac-Megantic Quebec, Plaster Rock New Brunswick on February 26, 2014 by stopcbr. GOOD NEWS! – VALERO CBR IS DEAD! Has someone stolen or vandalized your yard sign?